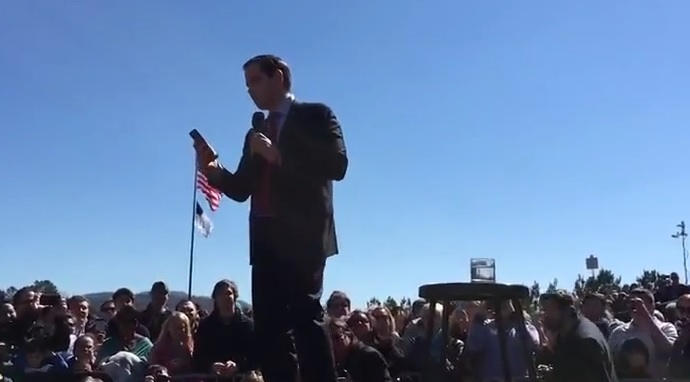 VIDEO=> MARCO RUBIO Hits DONALD TRUMP: "He Should Sue Whoever Did That to His Face"
Marco Rubio hit Donald Trump today at a campaign rally in Georgia. Rubio decided this week it was time to hurl personal insults at Donald Trump. Sen. Marco Rubio (R-FL) continued to ridicule his opponent for the presidency Donald Trump in front of a raucous rally of, according to the Rubio campaign, 7,000 people in Georgia this afternoon. Rubio told the crowd that Trump had been flying aboard “Hair Force One” tweeting mean things at him on Twitter. Rubio told the crowd that Trump inherited most of his wealth, dismissing his record as a successful businessman. “He is a guy that has been protected his whole life, has been privileged his whole life, has been insulated his whole life — nothing tough about any of that,” Rubio said. Rubio also questioned Trump’s vow to take on illegal immigration.